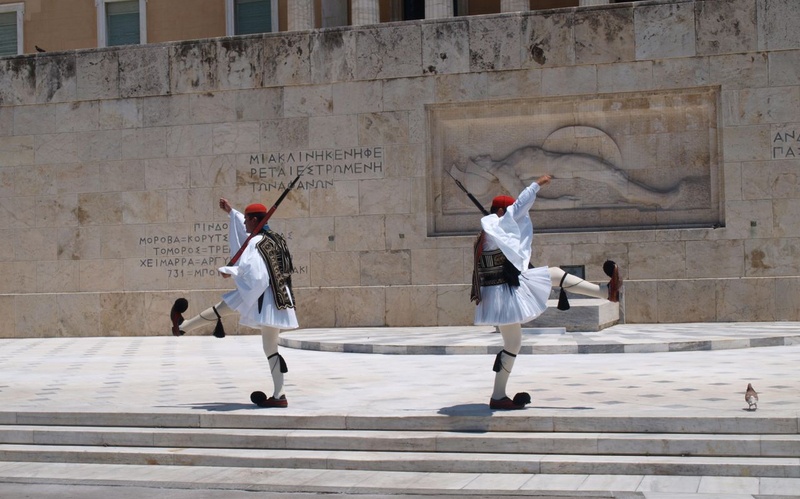 Tourist information for Greece that might help you before you come here or while you are here. Do not hesitate to contact us in case you need more info. Greece is one of the oldest countries of the world. The Greek name of the country is Hellas and the official name is Hellenic republic. **The population of Greece is about 10.940.000 (2001) and is divided in 49,49 % male and 51,51% female. Females have an average life length of 79,40 years and males 74,60 years. **The language spoken is Greek . Modern Greek comes directly from ancient Greek and is one of the oldest languages. The Greek alphabet has 24 letters, some not existing in latin-generated languages. Many greeks speak English as well as other languages like French, Italian, German etc. **Entry formalities: To enter Greece a valid identity card is required from all European Union citizens and citizens of Monaco and Switzerland . A valid passport is required from citizens of all other countries and entry visa for most of them. To get an entry visa the applicant must appear in person to a Greek consulate. **The currency of Greece is Euro. **Telephone system: All telephones in Greece have 10 digits. No prefix to call outside a city. To call Greece you have to dial +30 and then the 10-digit number. Mobile phones recognize a local mobile company when entering Greece. The local provider may change if you move in different parts of Greece. Use mobile phones as any other phone (no prefix to call a local phone, just the 10-digit number). To call your mobile phone from your country no need to put a prefix (they call you as if you where next to them). To call your mobile phone from other phone in Greece they have to dial first the prefix of your country and then your number. **Fire brigand: Ιn case of a fire dial 199 all over Greece. **First Aid: In case you need express medical care (need to be transported to a hospital) dial 166 all over Greece. **The time: Greenwich Mean Time +2. Along with the rest of continental Europe, the clock is advanced one hour during summer -from the end of March to the end of October. **The climate of Greece is middle Mediterranean with lot of sunshine and not heavy winter. The average temperature is : Jan 8C, Feb 8C, Mar 12C, Apr 15C, May 20C, Jun 28C, Jul 28C, Aug 28C, Sep 25C, Oct 19C, Nov 15C, Dec 10C. The average hours of sunshine are : Jan 5, Feb 6, Mar 7, Apr 8, May 9, Jun 11, Jul 12, Aug 11, Sep 9, Oct 7C, Nov 5, Dec 4. **Medical care You should feel perfectly safe to eat and drink everything and the tap water is safe. The health services are good and you will be able to find an English-speaking doctor easily. Residents of EU countries are eligible to receive free emergency medical care. Medical insurance is always a good idea for additional cover. In case of emergency you contact the concierge on duty of your hotel or if outside hotel the ambulance service at number 166. **Embassies and consulates: The concierge of your hotel will help you to find the telephone number of your embassy, or please call us. Greece has a history stretching back more than 4.000 years. The people of the mainland, called Hellenes, organised great naval and military expeditions, and explored the Mediterranean and the Black Sea, going as far as the Atlantic Ocean and the Caucasus Mountains. One of those expeditions, the siege of Troy, is narrated in the first great European literary work, Homer’s Iliad. Numerous Greek settlements were founded throughout the Mediterranean, Asia Minor and the coast of North Africa as a result of travels in search of new markets. During the Classical period (5th century B.C. ), Greece was composed of city-states, the largest being Athens, followed by Sparta and Thebes. A fierce spirit of independence and love of freedom enabled the Greeks to defeat the Persians in famous battles – Marathon, Thermopylae, Salamis and Plataea. In the second half of the 4th century BC, the Greeks, led by Alexander the Great, conquered most of the then known world and sought to hellenize it. In 146 BC Greece fell to the Romans. In 330 AD Emperor Constantine moved the Capital of the Roman Empire to Constantinople, founding the Eastern Roman Empire which was renamed Byzantine Empire or Byzantium for short, by western historians in the 19th century. Byzantium transformed the linguistic heritage of Ancient Greece into a vehicle for the new Christian civilisation. The Byzantine Empire fell to the Turks in 1453 and the Greeks remained under the Ottoman yoke for nearly 400 years. During this time their language, their religion and their sense of identity remained strong. On March 25, 1821, the Greeks revolted against the Turks, and by 1828 they had won their independence. As the new state comprised only a tiny fraction of the country, the struggle for the liberation of all the lands inhabited by Greeks continued. In 1864, the Ionian islands were returned to Greece; in 1881, parts of Epiros and Thessalia. Kriti, the islands of the Eastern Aegean and Makedonia were added in 1913 and Western Thraki in 1919. After World War II the Dodecanissos islands were also returned to Greece.